A drone was found crashed on whitehouse property. It seems to have posed no risk at this point, could have been a snoop playing with a drone, could have been journalists, spies, or terrorists...why worry? I think these drones are cool and would like to get one for my real estate business but they are also becoming a menace. They are violating privacy, trespassing and threatening aircraft. If you want to make a million bucks come up with a cheap means to take them down like a ray gun, EMT pulse generator or something that simply disrupts the radio signal. I wouldn't want one hovering around my yard taking video of me. Finding one on the White House lawn is a cause to be alarmed in my book. Iran already beat you to it. I'm going to say what I keep hearing over and over again about other privacy concerns..."If you're not doing anything wrong what's to worry about"? I had a quad-copter just like the one that landed at the White House. They are fun to fly, can go an amazing distance away from the operator (as long as you're using FPV equipment) and can return home if there's a break in communication. A couple of notes to those who are concerned about them spying... First, they are NOT quiet. You will certainly hear them coming unless they're up high. Most do not have zoom lenses so if up high enough that their sound is not audible the picture wouldn't show much detail, more of a high google maps shot. At 50 feet (still audible) the picture showed people that looked like the size of a small dog. Problem is, there are foolish people who do stupid things with them giving the rest of the owners a bad reputation. This current fool was drinking and decided to play with his which resulted in it's accidentally crashing on the W.H. lawn. OOOPS! That little stunt cost him at least $800 as I doubt they're going to give it back to him. Other idiots have flown them into fireworks shows and near aircraft. Just like any new "toy/tech" there's going to be growing pains and idiots until it's all figured out. Just wait until one gets sucked into a jet engine and causes the airplane to crash. They're supposed to stay at least 5 miles from an airport and under 400 feet in elevation. Air Canada Rouge Flight 1837, an Airbus 319 arriving from Toronto, reports a “disk-like” drone passing within 20 to 40 feet of the aircraft while at 3,000 feet, 10 miles northwest of Phoenix. WOW! Something needs to be done like yesterday or there will be some airline casualties. 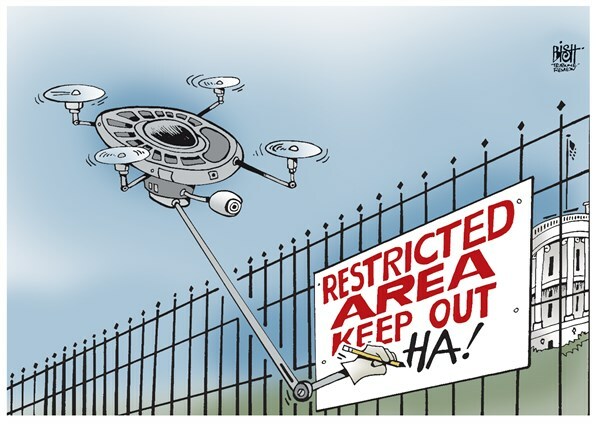 Laws to disallow drones from airports, government buildings...should help! Something was done "like yesterday", actually about 3 months ago. DJI, the manufacturer of the Quad Copter that is the subject of this thread put out an update to it's control software that stops the 'copter from taking off or flying near certain class airports. The airports are on the FAA list of major airports so that's how they were chosen. Rumor is they're updating again to add certain buildings now as well. As with anything else there's always going to be stupid people as well as people bent on nefarious actions. I know when I got mine and looked into the larger ones the first thought that came to mind was "just wait until some bad guy uses one to deliver bombs,drugs,guns, etc." Don't go drinking and droning.